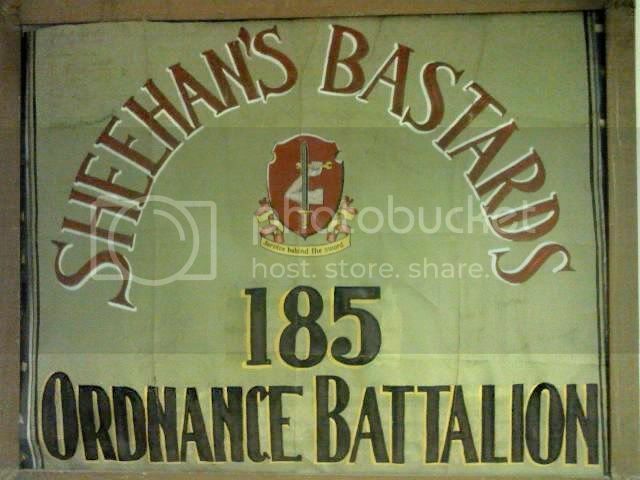 Thread: 185th Ordnance Battalion- "Sheehan's Bastards" sign? Hello all, glad to find this place and hope I can find some info on this sign. This belonged to my great grandfather who served in WWII. It hung in his garage for as long as I can remember. When he and my great grandmother passed away, my mother cleaned out the house and can you believe- she threw it in the dumpster!!!??? I rescued it and it now hangs in the office at my speed shop. It is hand painted and is signed by 26 people, including my great grandfather, Clarence 'Butch' Pillen, and John G Sheehan at the very top. Most of the other names are legible as well, if anyone is interested. What can you tell me about this sign? ANY information would be great!!!! Re: 185th Ordnance Battalion- "Sheehan's Bastards" sign? Was this a common thing, or just some 'boys club' a few people put together at the time? I've made some attempt to find something on the net and in some books, because i like this kind of story, but unfortunately, i didnt find nothing. I don't know if it was a common thing or a crazy and funny idea of a group of young soldiers. The only think we know for sure is that is a great souvenir of your great grandfather. Take care of it... I'll keep abroad about my searches.